While we do our best to accommodate last-minute registrations, our trips generally sell out in advance and we strongly encourage you to plan ahead and make reseravations well ahead of time. If you're looking for same-day reservations, please check our availability online or give our office a call at 1-800-532-7483 to check available times before heading out. We just want to make sure we can take you out on the course before you make the drive out! Disconnect from the day-to-day and reconnect to each other on our unique 3-hour Zip Line Canopy Tour. Our course is a genuine canopy tour built directly in the trees. It's a guided experience with 2 guides for each 8 guests. You experience progressively faster zips and a variety of tree types. Our 3-hour trek follows 11 zip lines, 2 sky bridges and 3 rappels suspended in the trees in the northern Berkshires and connected through platforms that sit high above the forest floor. 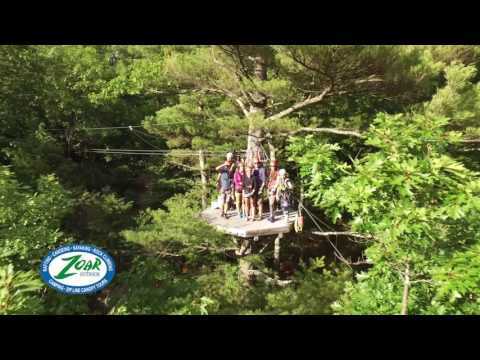 We were the first Zip Line Canopy Tour in southern New England when we opened in Charlemont, Massachusetts in 2009. Come experience our friendly professional guides and our emphasis on safety! Your lead guide zips first to each platform and then each guest in your party is clipped in, one at a time by the other guide who lets you know when it's okay to zip. Then you're off! As you pick up speed, the forest canopy opens up before you and you feel the exhilaration of the wind whipping by your face. As you approach the far platform, the lead guide signals you to brake or to keep coming so you reach the next platform at a controlled speed. Before you're unclipped from the zipline, your guide clips you into the belay loop on the tree so you're always clipped in at height. While you're watching your friends come zipping in behind you, check out the views out over the Deerfield River Valley and the northern Berkshires, the forest around you and that feeling of adventure you've just rekindled! "Matt and Abby were SPECTACULAR! Our entire group had a wonderful time because they were so professional and personable. This helped make a somewhat anxious activity fun for everybody!" - Kristen M.
"All staff from start to finish were terrific. They really take the experience to a higher level. This is the second time I've been and I'm always impressed by the staff interaction " - Stephanie S.
"Shout-out to DAVE AND AMANDA for being excellent guides. Great personalities, serious when necessary. Funny jokes from both." - Samuel M.
We ask that you wear close-toed shoes (hiking boots or sturdy sneakers). For your safety, no sandals or flip flops will be permitted. Wear comfortable clothing appropriate for the season, but avoid loose clothing that could tangle in ropes or other gear. Skirts should be avoided, and we also suggest avoiding short shorts for your comfort. On rainy or windy days, bring a light jacket or wind-breaker. For colder days, long pants, wool socks, and fleece are good items to bring. In late fall and early spring months, it is better to come with too many articles of clothing than to come without enough. We run our trips rain or shine, so plan accordingly. Some things to consider bringing are: a hat or balaclava that will fit under a climbing helmet, wool or Polypropylene long underwear top and bottom, insulated ski jacket or layers of fleece with a weatherproof shell, thin glove liners, and wool socks. Bring any required medications as well as extra money for souvenirs, etc. Guests will be asked to remove all items from their pockets before going on the tour, as we will not go back to obtain any articles lost along the course. Additionally, if you plan on bringing a camera, smaller cameras with a lanyard are best. If you bring your phone to take pictures you run the risk of dropping or otherwise damaging your phone. Please leave valuables in the car while you're on the tour. We can store your car keys for you while you are on the tour. The average tour takes 3 hours including registration and the 4 x 4 ride to the top of the course. Zip line canopy tours are open to anyone age 10 or up. Participants should be able to hike a short distance downhill and should be in reasonable physical shape. Children under 16 must be accompanied by an adult. Canopy tours are great for families, groups of friends, office groups, scouts and others. We have a minimum weight limit of 70 lbs and a maximum of 250 lbs. Since zip lining is gravity driven, we must adhere to these weight limits strictly for the safety of our guests. To ensure eligibility, we weigh each guest prior to participation. We can not allow pregnant women to zip. How high in the trees is the course? The course starts at ground level and reaches a maximum height of about 50 feet in the tallest trees. We start off gradually with short zip lines and lower platforms, working into the longer zip lines as the course progresses down the ridge. Yes, cameras are fine on the canopy tour but you should have a short lanyard attached to them. You should arrive at our base about 15 minutes before your start time to register and get ready. When you enter our base, our guides and base staff will help you register. You will be asked to sign a waiver of liability (minors will need to sign their own and have a parent/guardian sign it as well) and we will check to ensure that you have proper footwear and clothing. After you've registered, we will help you get into and properly fit your harness and helmet. Then it's up to the practice zip! A short hike from the base, our practice zip gives you a chance to get comfortable with zipping, braking and self-rescue on a short, low zip line. Once everyone is checked out and able to safely zip, our guides will take you up to the vehicles that will transport you to the top of the course. A 5 minute 4x4 ride brings you a mile and 500 feet vertically uphill to the start of the course where a short hike leads to the first take-off platform. The first zip is slow and short to give you a chance to get acclimated to flying through the trees. The second zip leads to a spectacular view of the Deerfield River Valley and the northern Berkshires as you perch over the edge of the ridge on a 100+ year old pine tree. Throughout the course, you'll ride 11 different ziplines. The zips vary in length and height but it is a progressive course, meaning the zips get longer and faster as you zip through the tour. You will also walk across two sky bridges, rappel from three platforms with the assistance of the trip guides. A rappel at the end of the top section of the course leads to a water break and a short downhill hike to the start of the next section. The lower course consists of sky bridges and longer zips that culminate your adventure in the trees. A downhill hike leads back to our base where you can share stories and memories of the trip and look at photos of yourself zipping just moments before. Registration for the Zipline Canopy Tour takes place at 17 Main St. in Charlemont, MA. You can park in the unpaved lot and head up to the green building. There, guides will meet you and help you get ready for your trip. We run our canopy tours in any weather conditions except lightning and high winds. Weather forecasters are notoriously inaccurate, even up to the day of the tour. You should assume that your trip is still running as scheduled unless you hear differently from our office. Weather related cancellations will be made just prior to your trip start time at Zoar Outdoor. Customers will receive a full refund or credit in case of operator cancellation due to weather or other unforeseen circumstances. If you have any questions about your trip in regards to weather, please call our office at 1-800-532-7483.